Kotobukiya’s line of DC Comics “New 52” ARTFX+ Statues continues, now expanding beyond the core Justice League members. First up in the new wave of superheroes and villains is none other than the world’s mightiest mortal, SHAZAM! The ordinary orphaned boy Billy Batson was summoned to the Rock of Eternity by the Wizard, keeper of magic, in a search for the next champion of good on Earth. Initially dismissed, Billy argued for his candidacy and was granted the magic word “Shazam” which spoken with good intentions transformed the boy into the magical powerhouse of the same name. Imbued with the classic powers of speed, flight, super strength, and invincibility, Shazam is still finding his way in the world as a hero. Shazam stands just under 8 inches tall in the ARTFX+ 1/10th scale, and was sculpted by Atelier Bamboo. 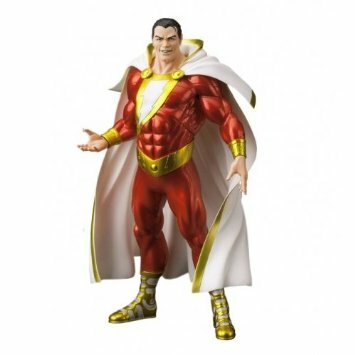 Like the previous DC Comics ARTFX+ statues, the powerful young hero features magnets embedded in his feet for extra stability on his included Shazam-themed base. He’s a great addition to any ARTFX+ collection, and the perfect companion to the upcoming Black Adam statue!